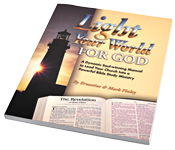 In Light Your World For God, Pastor & Mrs. Finley present practical, field-tested, proven principles that can make a dramatic difference in your church and community. These biblical principles have worked around the world, and will work in your local congregation as you lead your church into this carefully designed, biblically-based evangelistic process. God promises you an abundant harvest. Put the principles found in Light Your World For God into practice and watch what God will do. This may be the most important manual on witnessing you will ever read.